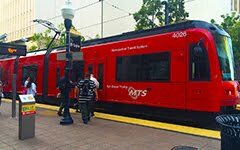 Unlimited Access: "Universities and public transit agencies have together invented an arrangement—called Unlimited Access—that provides fare-free transit service for over 825,000 people at more than fifty colleges and universities throughout the United States. The university typically pays the transit agency an annual lump sum based on expected student ridership, and students simply show their university identification to board the bus. " University officials reported that Unlimited Access reduces parking demand, increases students’ access to the campus, helps to recruit and retain students, and reduces the cost of attending college. Transit agencies reported that Unlimited Access increases ridership, fills empty seats, improves transit service, and reduces the operating cost per rider. The universities’ average cost for Unlimited Access was $30 per student per year. Student transit ridership increased between 71 percent and 200 percent during the first year of Unlimited Access, and continued to increase between 2 percent and 10 percent per year in subsequent years.